There looks like there is some pelican love talk going on between these two. but we will be returning soon to Philly and it always makes me a bit sad to leave such beauty. As you can tell by this post, I'm still crushin' on the pelicans. I don't know why it had taken me so long to take notice of their beauty. Some might disagree with the word "beauty" in the same sentence with 'pelican' ... but, as they say, beauty is in the eye of the beholder. I love capturing them in the many different poses they seem to take. Sometimes eyeing you as you come near. To their outstretched wings reaching to over six feet. I'll miss them when I leave. But then ... I can always count on them being there when I return. my last post on how you restore yourselves. nourishes each of you who stop by. you do take them at nice angles. I think I have always liked pelicans. You captured some great poses. You had me at Anna Maria :) Beautiful! 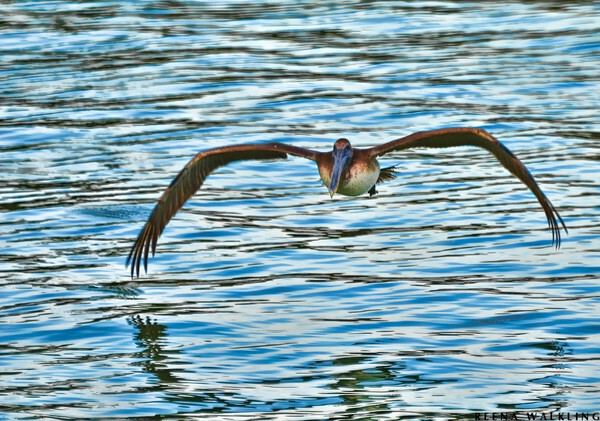 Love the pelicans, they're so cool to watch...and great fishermen. They are truly such unusual and fascinating birds! Your images capture them so wonderfully. I agree. They are beautiful. These are wonderful shots of the wonderful pelican! Oh, I love the pelicans and they are such fun to watch! Your captures are just awesome, Reena! Love every one of them! Hope you have a beautiful weekend with more visits with the birds! Enjoy the moment! Oh no!!!! I need to go out and buy another frame now!!!! Seriously, I may redo the whole thing and add two of these now! #5 and #7!!! Oh, beautiful is definitely the word! Love these. I agree I do believe Mr. Philip Pelican is strutting his stuff for the lovely Ms. Penelope!! Love how you've rendered these. So 'painterly'! 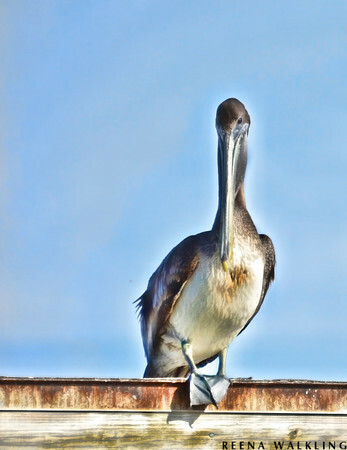 Pelicans are beautiful, and your photographic treatment accentuate their lines and form. Great job. OMG I'm so in love with those images. I fell in love with Pelicans when I saw them up close for the first time during a vacation in North Carolina. I don't know what it is about them . . . but there's definitely something. Reena, seriously, what you do to your captures! They don't look like photos, but amazing paintings. You really alter better than anyone I've ever seen. I like your new imprint. It works and is not intrusive because your photos look like a piece of art. Wow! Oh, I love pelicans! Such interesting birds. You sure captured them at their best. HI Reena...These are fantastic..I don't know what technique you used but it works well here I just love these of the Pelican images especially the first one ...so cute!! It sounds like you are having a wonderful time Reena, and the photographs are fantastic. Those beaks never fail to fascinate me. Sending you wishes for a beautiful weekend. They are really neat birds in their own way. One of my favorites. They may appear as an ungainly bird but are so graceful in flight. I like them because they are so unusual, kinda funky, along the lines of a platypus. 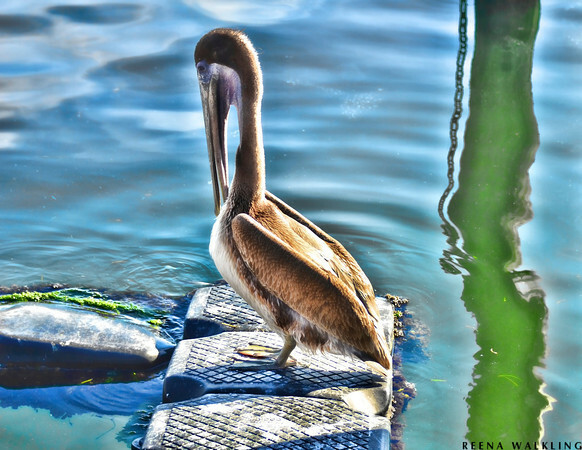 Amazing Pelican photos, Reena! I think they are beautiful birds too. Wonderful post, have a great weekend! Oh, wow. That last one. Love! Nice to know you can count on them to be there when you return. They are awesome birds and your photos deserve frames! I think they are beautiful and you have taken some amazing photos! You DO make them look very beautiful. Your blog always provides such refreshment to my day. 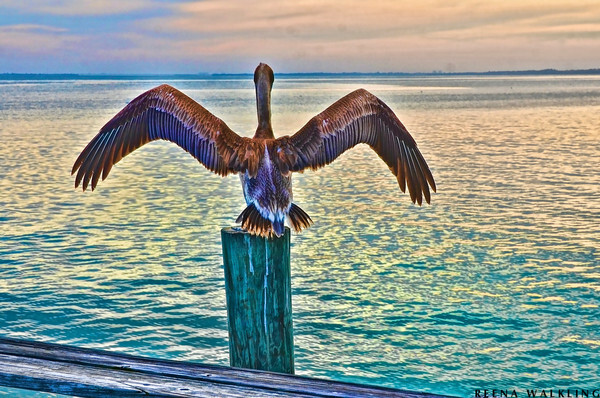 very cool shots, we don't see pelicans here!! Those pelicans are great, I do think there may be some flirting going on in the first one. 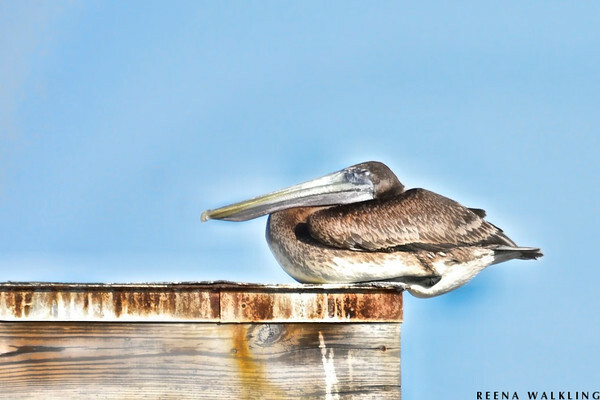 I am surprised that the sitting pelican doesn't fall off that perch, it doesn't look that stable. Thanks for sharing these. Wonderful pelican captures, so much variety. Your pelicans are somewhat different to those in our part of the world. 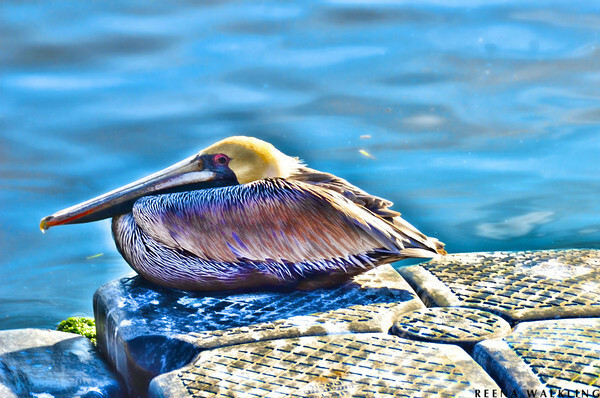 The pelicans are majestic and sweet and winsome in your series of shots. I had never seen them from compact to open that way, and the effect is so cool. Too bad you have to leave the warmth and beauty here. Wow! I have not appreciated Pelicans before. They are cute now that I look at them more. I enjoy the pelicans also. they are a real sight to see when in flight. Amazing when they dive bomb their fish meal. They dive from some pretty high up. I just love seeing your shots.. 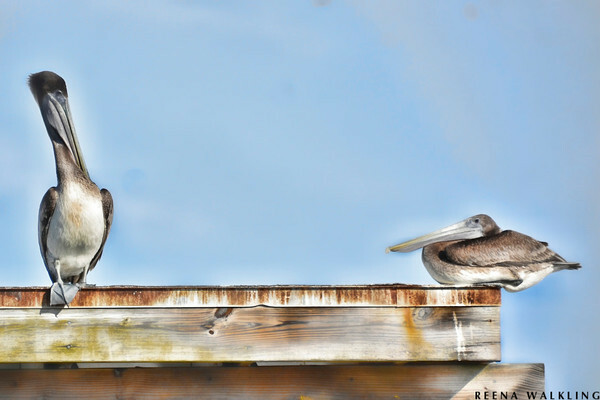 Your editing is amazing.. You make the pelicans look so beautiful..
Looks more like an old married couple to me! But I love pelicans. You did an extra fantastic job with those photos! If it is a love talk, then the one on the right must be bored. How could you not like pelicans! We saw lots and lots of them on our recent holiday. Wow, I love the photo of the bird over the water with his wings stretched out. So pretty. 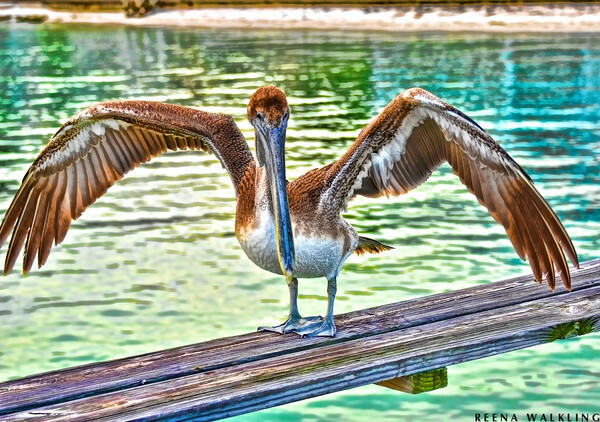 The pelican is one of my favorite birds! You got so many good poses from these. I really love your "compact" model. I've never seen one in this position before! I LOVE Pelicans and rarely get to see them!! These are FAB! I'm a definite pelican lover! More, more!